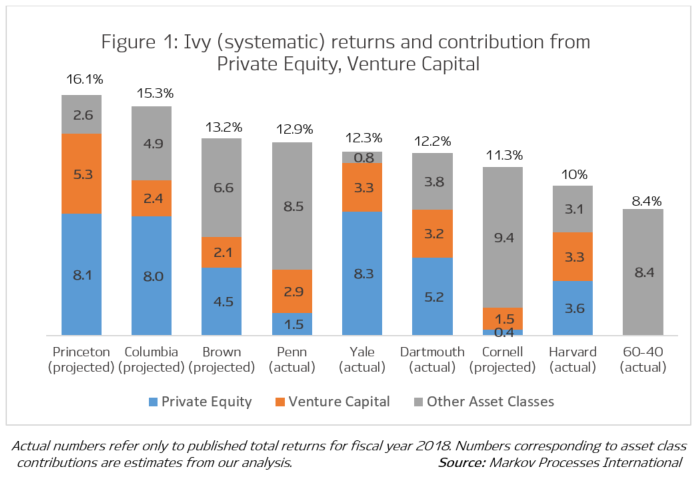 Returns across the Ivy League are largely seen as being driven by exposure to private equity and venture capital. Based on the factor-mimicking portfolios we have constructed for each Ivy League endowment using our patented Dynamic Style Analysis (DSA)1 model, we’re projecting Princeton and Columbia endowments to deliver the highest returns among the Ivies in fiscal year 2018. Currently, Brown leads all Ivies with 13.2 percent,2 a number we accurately projected in our recent post, Measuring the Ivy 2018 Halftime Report. Our fiscal year 2018 projections are based on the latest estimated exposures obtained by using reported annual endowment performance through fiscal year 2017 and asset class performance numbers for 2018. Although most of the reported Ivy endowment results came within 50 basis points of our projections, some differences, driven by specific investment decisions, were expected. At the same time, our results underscore that, similar to pensions, the lion share of elite endowment performance is explained by their exposure to major asset classes. 1DISCLAIMER: MPI conducts performance-based analyses and, beyond any public information, does not claim to know or insinuate what the actual strategy, positions or holdings of the funds or companies discussed are, nor are we commenting on the quality or merits of the strategies. This analysis is purely returns-based and does not reflect actual holdings. Deviations between our analysis and the actual holdings and/or management decisions made by asset owners and investment managers are expected and inherent in any quantitative analysis. MPI makes no warranties or guarantees as to the accuracy of this statistical analysis, nor does it take any responsibility for investment decisions made by any parties based on this analysis.